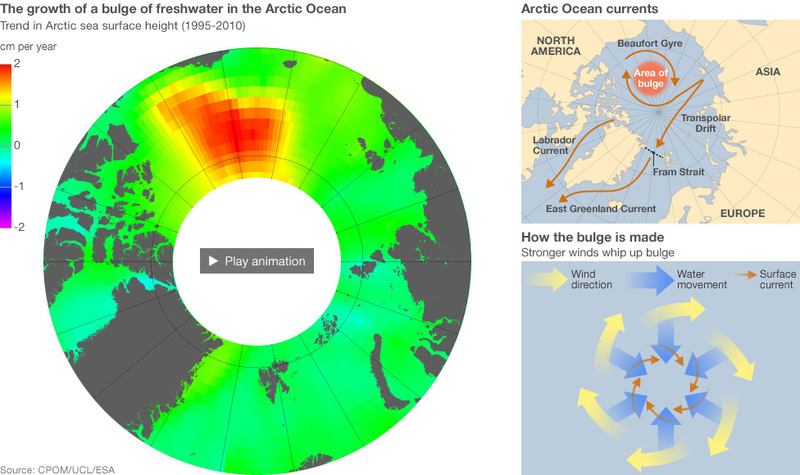 Two science articles caught my attention today, about events happening in the Artic Circle. Reading the first article lead to my finding the second one. UK scientists have detected a huge dome of freshwater that is developing in the western Arctic Ocean…. If the freshwater were to enter the North Atlantic in large volumes, the concern would be that it might disturb the currents that have such a great influence on European weather patterns. Recent observations suggest that because of global warming, the natural rhythms of the Beaufort Gyre have been tipped out of balance. To find out what this means for the future of the Arctic climate, scientists from the United States, Canada, and Japan will set out every summer from 2003 to 2014 for month-long expeditions aboard the Canadian icebreaker Louis S. St-Laurent. 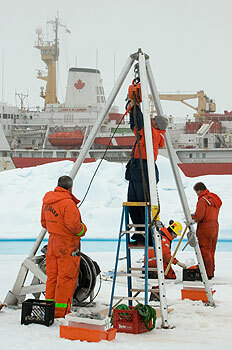 They are using an array of newly-developed instruments to measure the environment above, below, and within the floating icepack.